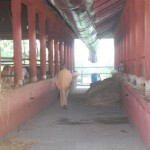 in the same place, the cow barn of Govardhan Eco Village (GEV), he had expressed how important these halters were. “These halters help us in administering medicine to the cows when they are sick. They are even approved by PETA.” But despite the explanation, Radhanath Swami wasn’t satisfied; he thought the cows weren’t happy with the halters around their mouths. So Nanda Nandan had walked out, looking for a sickle. Now, having relieved the cows of their halters, Nanda Nandan too felt that the cows looked happier. 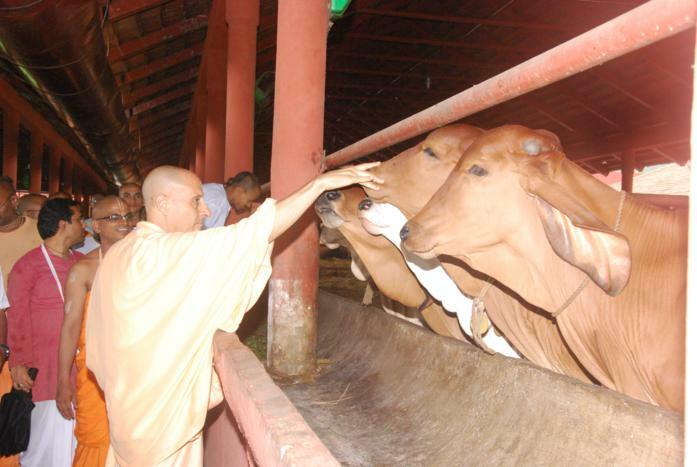 “We shall never put them back on our beloved cows,” he proudly proclaimed to Radhanath Swami. The crowd that had gathered, hundreds of residents of GEV, cheered in approval. They had just witnessed one of the highlights of Radhanath Swami’s two day visit to the Eco Village. The overcast sky drizzled, bringing along a cool breeze. The discussion in the barn now turned to the new challenge confronting the cowboys—how to administer medicines to the cows without the help of the halters? 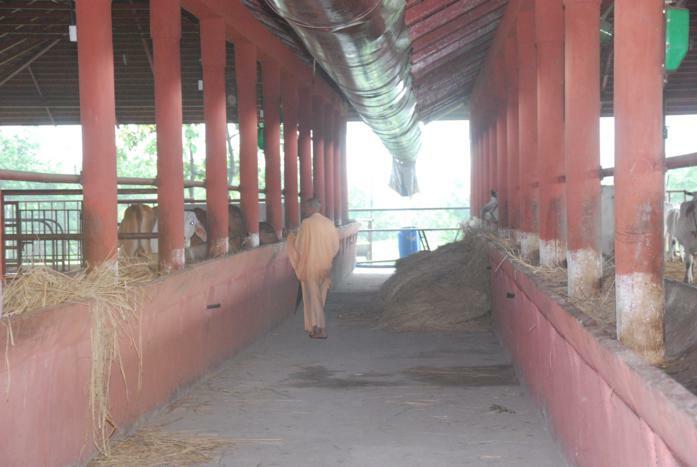 Radhanath Swami broke away from the crowd, to take a stroll through the spacious cowshed. He walked back and forth the long corridor that ran along the length of the barn. Was he contemplating on a solution? After several minutes, he returned. “All the time if the cows experience sufficient affection and love coming from us, they won’t hesitate to eat even medicines from our hands; then there won’t be a need to use a halter to force it through their throats. So I request that all residents of GEV spend at least a few hours every week serving the cows, sharing kindness and love.” Applause filled the air, in response. Everyone heartily welcomed Radhanath Swami’s innovative way of dealing with the situation. Even the cows in the barn cupped their ears, as if welcoming the new announcement. Mahraj gave such a deep and profound solution. What cows really need is Love and not halters. Jai all glories to HH Radhanath Swami Maharaj Ji. How affectionate and caring Maharaj is! Radhanath Swami is truly compassionate even to the animals! It’s true that animals respond to the love and care they receive! Thank you for sharing this article filled with such deep lessons on how to serve mother cow. Thank you Radhanath swami. Radhanath Maharaj truly exhibiting the quality of loving all living entities by a realized soul. Although we hear we don’t follow. Jai HH Radhanath Swami Maharaj! Compassion over all living entities is the symptom of a saint. He has solutions for all the problems. All glories to HH Radhanatha Svami Maharaja. Nice experience with HH Radhanath Swami Maharaj! Maharaj knows the solution of each and every problem and the solution is love. Radhanath Swami Maharaj ki Jai. Who can remain unhappy and uncared for in his shelter? No one!!!! Krsna has send him to give us shelter. Thank you for sharing. Radhanath Swami is so sensitive. It is one of the qualities of Vaishnavas. What is a halter? can you please describe it? Radhanath Swami keeps reminding us of we should practice what we preach by his own example, he is personification of love and compassion, it can be seen by the way he dealt with cows of GEV. Heart-touching incident. Cows are our mothers. Thanks to Radhanath Swami. Thanks for sharing. Beautiful. A lot to learn and apply in day to day life hare krishna. Love and affection is so important part of our life. Maharaj taught two lesson in one incident. How to take care of cows and need of love and affection to develope relationships. Swamiji’s heart is so soft…….. Very compassionate to every individual souls. Jay!! Maharaj’s association makes everything auspicious. Thank you very much for sharing wondeful moment. This is heart touching story where Radhanath Swami showing so much love on cows. This is heart touching story where Radhanath Swami showing so much love on cows. Radhanath swami ki jai! If he cares for cows so much, how much is he caring for his sincere disciples and well wishers. We should give thought to this mood of maharaja. Jai! Al Glories to HHRNSM, Haribol! Maharaj is so affectionate and loving, simply blissful!! All Glories to Maharaj, Haribiol! Radhanath Swami has amazing way of handling all the situation.. not through force but through love. Thank you for sharing. Thanks for sharing. Cows also needs care,kindness and love from us. recently we had visited the eco-village with a group of new members and we had been to the goshala as well. It was wonderful to see the cows so happy and loving and it reminded me of this experience of Maharaj, Haribol, Ys! wonderful experience and thank you for sharing it will all of us. Jai Gurudev!! 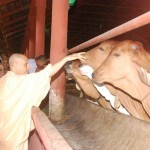 Radhanath Swami is sensitive even to the feeling of cows and simultaneously practical in his approach. Only a saintly person like Radhanath Swami can be so compassionate as to discard seemingly practical solutions as putting on halters to administer medicines to cows. Radhanath Swami is teaching here language of love! Amazing! Wonderful and inspiring story of Radhanath Swami’s compassion and love. It’s amazing to see how he is so kind to everyone.